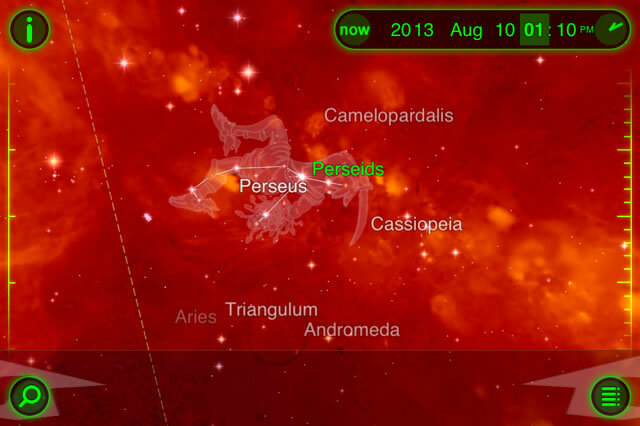 This is a screenshot of the Star Walk app showing the Persieds in the Northeast sky. Notice how close they are to Cassiopeia- and her recognizable W shape! As far as Grecian heroes go, Perseus really has it all. He’s the son of Zeus and Danea; so he’s got the fame. He’s slayed his fair share of monsters, including “snake-for-hair” Medusa; so he’s got the street cred. He rescued the damsel-in-distress Andromeda from a serious sea serpent set upon her by Poseidon; so he’s got the girl. With a resume like this, it’s not surprising that Perseus is one of the most recognizable constellations in the night sky. Each summer in Northern latitudes, we are treated to the Persied Meteor shower. These meteors are actually remnants of the tail of a comet named Swift-Tuttle. This comet orbits through our solar system, and its tail debris stretches hundreds of thousands of miles through space. As the comet crosses Earth’s path, bits of rock and ice slam into Earth’s upper atmosphere, and we get to view to some of the most spectacular “shooting stars” in the Northern Hemisphere. 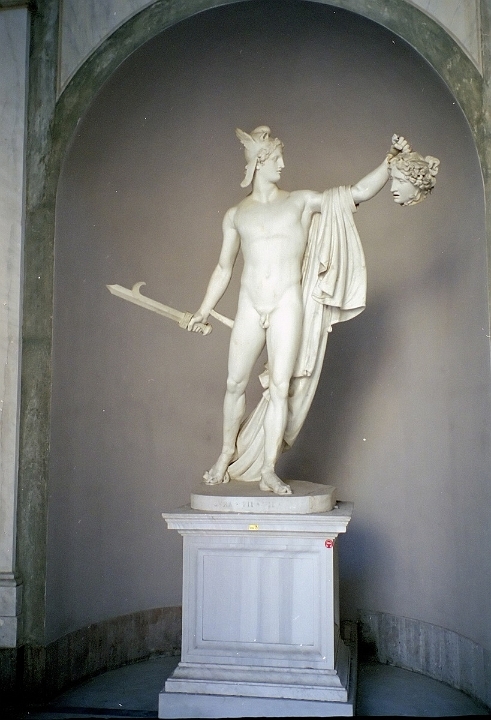 Statue of Perseus with the head of Medusa at the Vatican. The Persieds began in July, but will be peaking this week. Gazers can expect to see up to 50 meteors per hour in the Northeast sky radiating from the belt of the constellation Perseus. The full peak of the shower will be on Sunday, around midnight and the view should be great this year as the moon is only at 32% of full. Here are some tips for viewing! 1. Watch all week — Sure, the meteor shower peaks Sunday, but there will still be lots of streaking debris through next week. The best time for viewing with the least amount of moon interference is immediately proceeding dawn. At that time, the moon will set just a bit before the sun rises, so there will be a few minutes of great dark skies. 2. Get out of town — City lights of any kind are going to obscure your view, so head out to the country to the darkest spot you can find. I’d suggest camping out at a local State Park and setting an alarm to wake you up in the wee hours of the morning if you really want a great view. 3. Find a moon shadow — The moon will be shining low in the southern skies around dawn this week. If you can find a barn or big tree or hill, you can sit on the north side and amplify the darkness. The darker the sky appears for you, the more meteors you’ll see. 4. Bring a sky map — If you’re going to be out star-gazing anyway, bring a sky map. There are five planets that are visible from Earth with the naked eye, and three of them appear in August (four if you’re lucky enough to glimpse Mercury just before sunrise). Saturn will be in the West in the early evening, and you can even view its rings with a telescope. As Saturn sets around 11 p.m., you should see Jupiter rise, and then Mars will follow Jupiter’s path in the sky a few hours after that. Besides the planets, it’s a fun time to find constellations like Queen Cassiopeia in her “W” shaped chair, Canus the dog, Ursa the Great Bear (A.K.A. the Big Dipper), Ursa Minor the Little Bear (A.K.A. the Little Dipper), Taurus the Bull, and many more. 5. Get the App — I apologize for the advertisement, but for my money, the app “Star Walk” (available on iPhone and Android) is simply one of the best celestial aids out there. Point it at the sky to see a map of the constellations you’re looking at. Point it at a major star and find out where it is, how big it is, and how many millions of year old the light you’re viewing today is. Besides the great live features, the app also gives you a picture of the day and a calendar — without which I would have forgotten the Persieds. The app is $2.99 for iPhone and $4.99 for iPad. It’s totally worth it. I hope you follow your Adventure Foot for some star-gazing this week. Your next best chance for a meteor shower will be this winter when the Geminids will be streaking through our skies, but believe me when I say that sitting outside in August is substantially more comfortable than doing the same in January. P.S. — I couldn’t write a blog about the stars without mentioning my favorite poem of all-time: When I Heard the Learn’d Astronomer, by Walt Whittman. FREE Fishing in Illinois this Weekend! Do you need a fun family adventure this weekend that doesn’t break the bank? 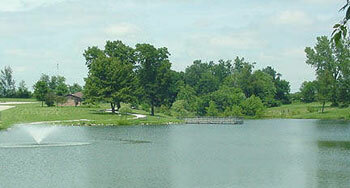 Celebrate National Get Outdoors Week with FREE FISHING in Illinois! The free fishing event runs June 8th– 11th and it means that anyone can go fishing on any DNR site (state parks and rivers included) in the state without a fishing license, inland trout stamp or salmon stamp these four days only. I blogged last week about Siloam Springs State Park- and it’s the perfect place to go to take advantage of the statewide free fishing. Crabapple Lake is stocked with largemouth bass, bluegill, redear and green sunfish, carp, crappie, channel catfish and rainbow trout. Rowboats are available to rent at the rates of $8 for 2 hours, $11 for 4 hours or $15 for the day, and canoes are $8 per hour. There is also a bait shop on-site and a boat ramp for personal craft (only electric motors allowed). For more on Siloam Springs including trail information, click here! In addition to the statewide event, local children and adults can try their hand at angling on Saturday, June 9th at Quincy’s Moorman Park. The Quincy Park District, KICK-FM, Y-101, and Gamemasters are presenting the annual Fishing Rodeo. It’s free to attend, and since June 9th is a free fishing day in Illinois, no fishing license is required! There will be four different age groups, from kids to seniors! The person that catches the longest fish in each age group will receive a one hundred dollar gift card from Gamemasters! Many other prizes will also be awarded. Registration starts at 1pm, and you’ll fish from 1:30 to 2:30. For more information, contact the Quincy Park District at 217-223-7703. National Get Outdoors Week is also being celebrated at many national parks this weekend, with many locations waiving camping, entrance or facilities fees. Check local parks for specific information. 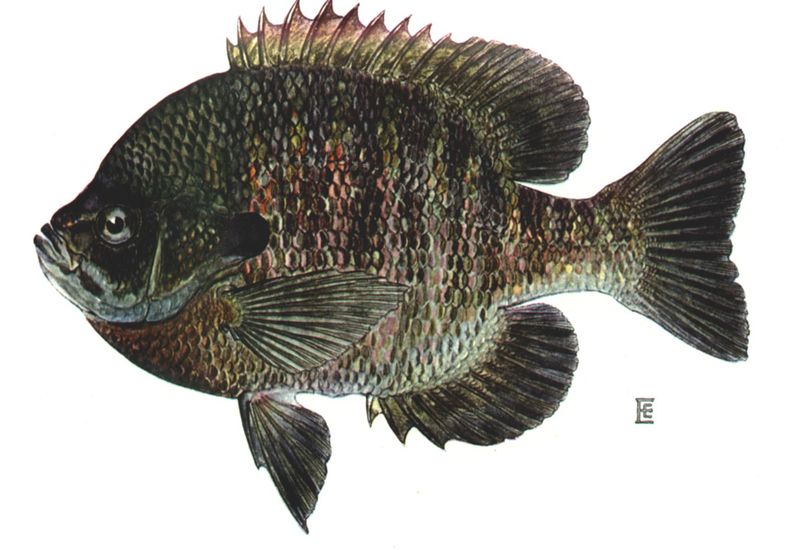 The State Fish of Illinois, as voted on by school children in 1986, is the Bluegill! Bluegill are common in rivers, lakes and streams throughout the state. Bluegill are actually a carnivorous fish and eat bugs, larvae, snails, crayfish and algae. They grow to be around 9 inches long and weigh 12 ounces. Yesterday, I wrote a blog about the Transit of Venus, which will occur today, June 5, 2012 and will not occur again for another 105 years. I sketched out a diagram of how to make a pinhole viewer to watch the event and posted it and it here and my blog brought up an interesting conversation with my friend, Doug. I told him that I realized the last time I had made a pinhole viewer was when I was in Baldwin School. 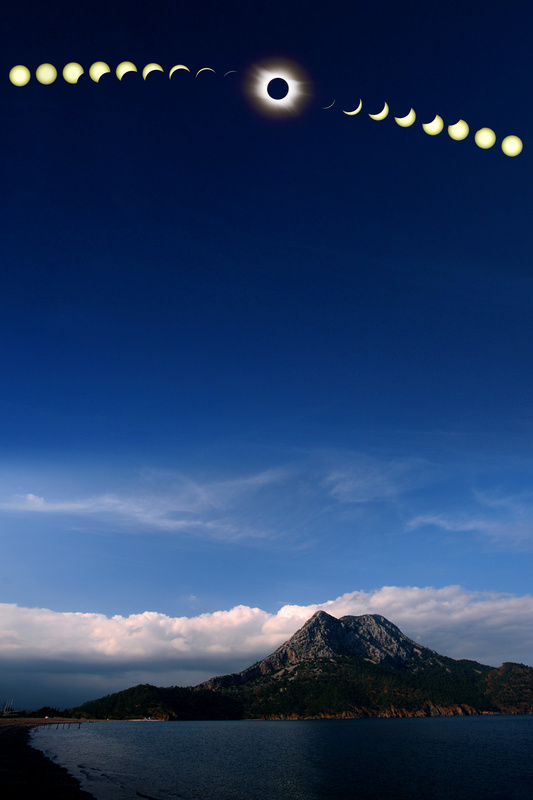 nasa.gov photo of an eclipse viewed from Turkey. I didn’t know Doug back then, but he knew when the event was because we were both in 5th grade at the time, and we both had made pinhole viewers, and we both had spent a week talking about space in our 5th grade classrooms prior to the big eclipse. And many, many other classrooms full of kids and office buildings full of adults emptied outdoors on that spring morning to watch an event that has fascinated people since the beginning of time. The most unique power of events like the Transit of Venus or an eclipse is the power to connect people. In these situations, the planets and the sun aren’t doing anything out of the ordinary. They just happen to cross paths from our line of sight and they move out of alignment with no more cosmic fanfare than what they moved into it with. The part of the event, then, that is so extraordinary, is the grand marking of time across huge swaths of the planet. Life is fragmented and is only becoming more so. Occasionally, there is a moment where time is marked in such a dramatic way to so many people that, years later, people will say, “where were you when…?” But as a culture, we no longer gather around a single radio or a television set and share an experience. 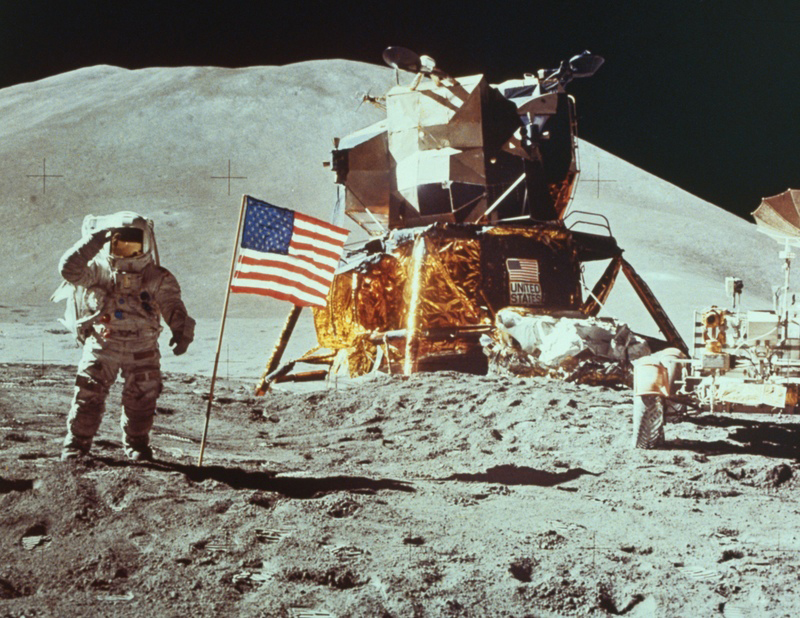 Everyone alive for, say, the moon landing will always remember it as the same broadcast. When world-changing events happen today, we consume media from a hundred different sources, through a hundred tinted lenses, and remember the moment a hundred different ways. But then, there’s the pinhole viewer. The Transit of Venus that I’ll view through my homemade pinhole viewer will mark a little moment in time, and the universe probably won’t take any notice. It won’t happen again while I’m alive, so it’s neat to see it tonight. The TOV isn’t going to have the same level of excitement as a full solar eclipse, but it can remind us of something very important: All over the world, we’re looking out at the same cosmos. We don’t all share much, but we do share that. And I’ll be looking at the heavens today through my once-a-shoebox pinhole viewer and someone else who I don’t know in a place I’m not thinking about will do the same thing. And maybe that little bit of sharing across time and space is enough to make us all feel a little more connected. Click here to read my first blog on this topic. 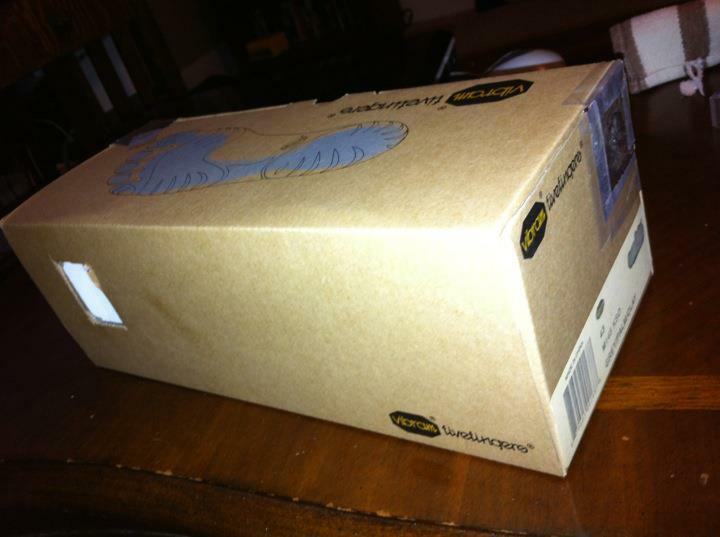 Learn more about the Transit of Venus and how to turn a shoebox into a pinhole viewer! Also, PLEASE write comments! I’d like to know what *you* think! David holds up a partially started honeycomb. …There were many more puns where these came from. Just 2 weeks ago, before my big Vermont race, I had a closer-to-home adventure. My husband and I were headed to Peoria, IL to visit my brother’s family and his new baby (aww, Carson’s so cute!) and I figured as long as we were in the area, we should stop in and see my friends David and Jessica. They invited us out to cycle on the Peoria River Trail, but David asked if first we’d like to come check out his backyard beehives! David has 2 hives at the location I visited, and I don’t know what I imagined before I got there, but it certainly wasn’t as scary as I expected. We walked up through a pasture where a couple of paint horses stood grazing, and back in a corner near some blackberry bushes were 2 small white boxes surrounded by a little fence (presumably to keep the horses from accidently getting too close.) I imagined we’d have to put on full bee-suits to be anywhere near the hives, but that wasn’t really the case. David adds a few puffs of smoke to the hive. We walked up in our regular clothes to just outside the fence, maybe 3 feet from the hives. The bees were visibly buzzing about, but didn’t seem real worried about what we were doing. David gave me the top half of a bee-keeping suit and donned just a mask himself. 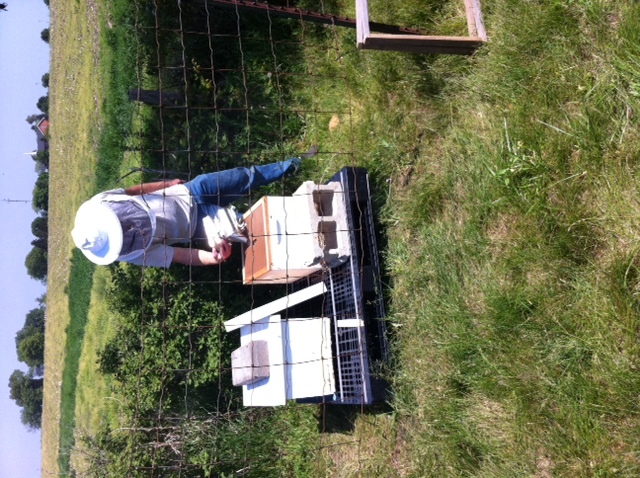 He took out a small bee smoker and explained how it worked. There is basically a little can on one side of the smoker in which you put a bit of tinder. David favors using some newspaper and dryer lint. The tinder is lit, the lid is closed, and a couple of little pumps of the bellows is enough to let out a couple of gentle puffs of smoke. The smoke simulates a forest fire and the bees are distracted into tasks like sucking up honey to move as they would have to if a real forest fire was in progress. This task becomes more important than whatever the beekeeper is doing, so it basically keeps the bees occupied. You can tell I’m still nervous here because my hands are tucked in the shirt! I was still a little nervous walking up to the hive, so I tucked my hands inside the beekeeper’s suit and kept my arms down to my side (I worried that one would land on my side and then get crushed when I put my arms down and I’d get stung in the armpit… lol. Maybe I have an overactive imagination!) Anyway, David puffed two or three little doses of smoke over the first hive and proceeded to take off the lid. He explained that these hives were fairly new and contained a combination of frames that had starter material for the bees and blank frames that the bees would start building on themselves. 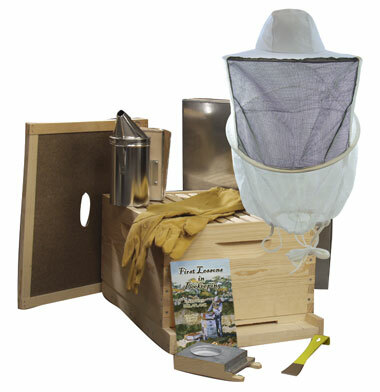 The starter frames are designed to encourage the bees to build vertical comb that can be easily lifted out for harvesting honey. One of the maintence tasks David was there to do was to knock down any of the horizontal bridges the bees may have built between frames in order to keep the frames from being stuck together with comb. 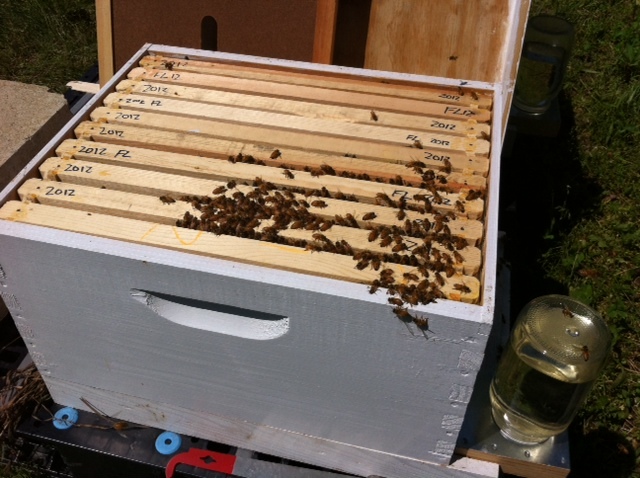 He lifted the first frame out and I was surprised to see it heavy with bees. I figured the whole hive suddenly going airborne would, ya know, startle them, but they kept right on working like nothing strange was going on. David pointed out the structures they were making- some of the honeycomb was already filling up with honey and had “capped cells” on it, others were cells designed for bee larvae or pollen storage. I got a little braver as he was pointing out structures and came close to watch what all of the bees were doing. The hive was really fascinating. The worker bees are all infertile females, and they were busy doing different jobs. Some had large pouches of pollen collected on their legs, some were guarding the entrance to the hive, some were building honeycomb and some were headed out to the blackberry bushes. We only spotted a few male drone bees in the hive; drones are identified by their larger eyes and somewhat stout appearance compared to the workers. Did you know that male drones do not have stingers and are pretty much around just to mate with the Queen? Then they die. It’s a tough life. 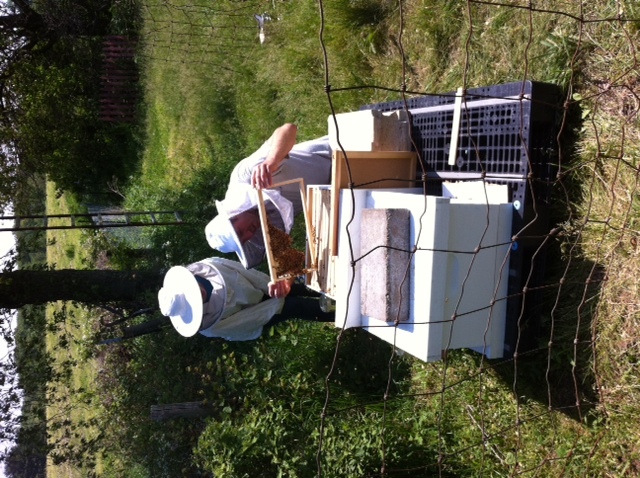 David lifted out a few more frames, and finally we found the queen bee. She was being followed around by a little cadre of workers that presumably took care of all her needs. She was pretty easy to spot in this hive- she’d been marked with a little white dot on her back. Besides, she was twice the size of any other bees there. One of the neatest things I learned about the hive is that the bees maintain it at a pretty constant temperature around 85 degrees Fahrenheit (28 degrees C.) In hot weather, like the day we were there, the bees spread out and can even beat their wings to serve as a fan to cool the hive. In the winter, the bees will gather to the center of the hive and form what’s called a “winter cluster” where they are basically bundled for heat conservation. I also learned that a full frame covered in bees is quite heavy- when I finally worked up the nerve to hold one I was really shocked at the weight! You can see the Queen in the lower left! Anyway, because I couldn’t resist, I asked David if there was any honey ready to try. He pointed some out and, like Winnie the Pooh, I stuck my paw in the comb and got out a little taste of honey. The honey was aromatic, sweet and just plain delicious. I noticed that it had a sort of citrusy smell and David explained that this particular hive was ordered from an apiary (apiary= group of kept beehives) in Florida and was raised on orange blossoms! The new honey the bees would be making might take on the flavor and aroma of the nearby blackberry bushes. The take away from all of this is that honeybees are not as scary as I thought they were, that honey fresh from the comb is just plain awesome, and that backyard beekeeping is a really interesting hobby. Honeybees are especially important in agricultural areas like Illinois and backyard beekeepers like David are helping to monitor for Colony Collapse Disorder and other diseases affecting these important pollinators. There are many resources you can consult to learn more about backyard bee keeping, but I’d recommend checking out Dadant and Sons Company. They’re based just 30 miles from Quincy in Hamilton, IL and are the oldest (since 1861!) and largest beekeeping supply company in the US. And- because how many songs really talk about apiaries- I *had* to share my friend Pres Maxon’s song: Apiary in an Orange Grove (it’s the first track on his Vol. 1 album). All his tunes are great and worth the download! 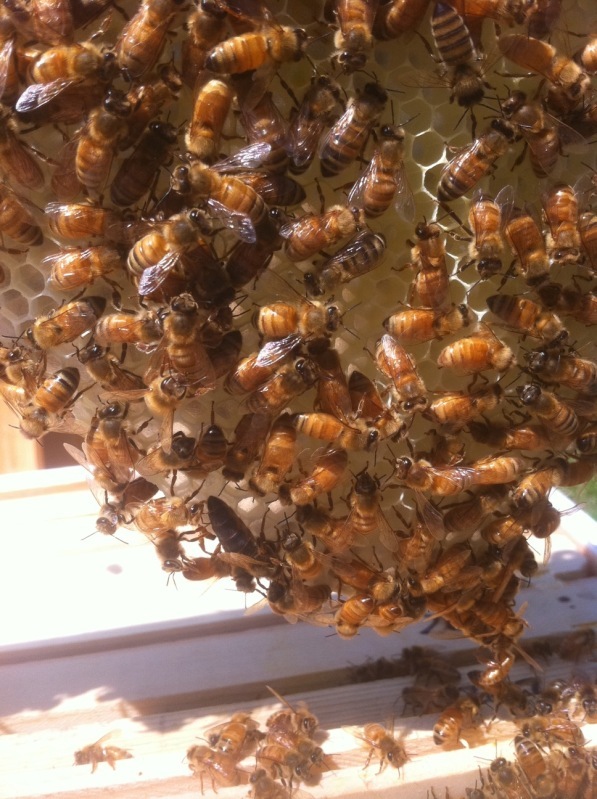 For lots more great pictures from David’s hives, click here! As many of you know, dozens of states from the east coast to the Rockies closed all public caves since 2006 to contain the spread of a disease that kills bats. In the past few years though, it’s become clear that the primary way the White Nose Bat Fungus is spread is among the bats themselves, and that if cavers are clean and responsible with their equipment, caving can resume without further endangering bats. You can read my entire blog about the bats by clicking here. I applaud Iowa for taking the first steps in restoring cave access so that visitors can explore this unique and important ecosystem. My hope is that other states (ahem, Illinois and Missouri) follow suit to educate the public and reopen caves. There’s no better way to protect an ecosystem than helping people learn about it and experience it first hand. This summer visitor’s to Maquoketa Caves State Park will once again have the opportunity to explore the many caves there. The caves have been closed since 2009 to slow the spread of a fungus, called White Nose Syndrome (WNS) which is deadly to bats. Since first detected in 2006, WNS has contributed to the deaths of over 5.5 million bats across the eastern North America. It is known to spread from bat to bat. Officials are also concerned that it might inadvertently be spread from footwear and clothing worn by cave explorers moving from one location to another. The DNR is still very concerned about the risk of spreading WNS from cave to cave by persons carrying the fungus so visitors will be asked to attend a short program informing them of the risks of WNS. This program will also help visitors identify what would put them at risk of transmitting the fungus. Once visitors have attended this program, they will receive a wristband that functions as a permit for cave exploration. Maquoketa Caves is hiring extra summer help to provide this program as well as guided tours of Dance Hall Cave and other natural features of the park. We are very excited about having interpretive programs available at Maquoketa Caves again. Feedback has demonstrated the high value to visitor experience that a professional guide offers. There is so much to experience and learn at Maquoketa Caves and we are very happy to be helping people get the most out of their experience there. In cooperation with the Friends of Maquoketa Caves, we will be hosting a grand opening on Saturday April 14. We are calling it “Pancakes in the Park” and will be serving pancakes and fresh home-made maple syrup harvested from the park trees themselves. There will be several educational programs available as well as cave tours. The open house is from 9 AM – 12 PM. The programs and tours will continue until 2 PM. Starting May 26 staff will be providing the WNS Awareness Program for cave access from 9AM to 7:30 PM. From April 14 to May 26 we will be providing programs as often as possible and visitors may stop at the park office to contact staff about getting a permit for cave access. If you have a group that would like to visit the caves, please contact the park prior to coming to make arrangements for a guided tour and the WNS Awareness Program. I was cycling on a blacktop road near Burton, Illinois, and in the distance a bald eagle’s white head stood out bright against the backdrop of a crystal blue January day. 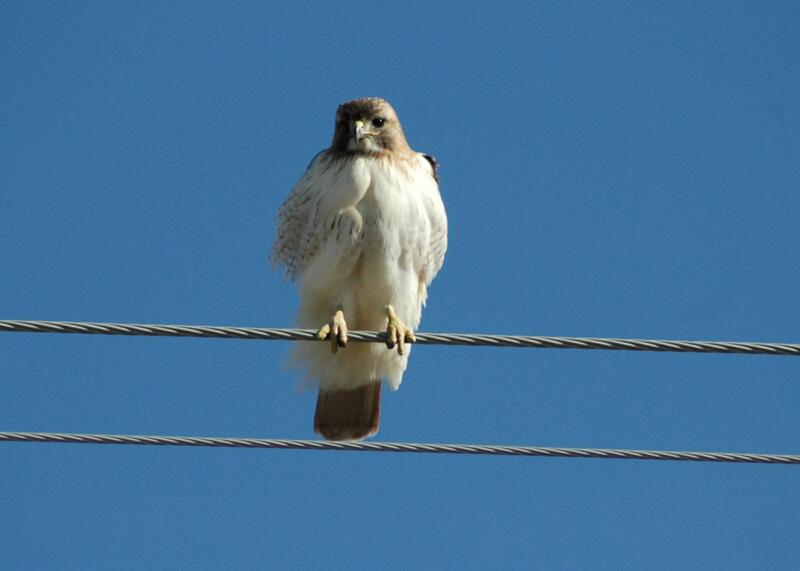 He was sitting to the left of the road on an exposed tree branch, likely hunting for some rabbits or voles that were out in the empty farm fields. I’m sure the eagle’s trained eyes saw me from much further away than I saw him, but he watched my approach with his head cocked to the side, and, excuse me for anthropomorphizing, his expression was one of bemused curiosity. At some point, the eagle decided that maybe my approach was a little too fast, and he launched himself into the air and glided on his enormous outstretched wings across the field. The field dipped away on the side he was on- so that he flew almost level with the road- and I saw the opportunity to ride alongside him as he flew to the east. I pushed up to over 20 mph and the eagle ended up on my left side nearly at eye level as we raced down the road. I had definitely increased my speed to get a good look at the eagle, but I couldn’t help but feel like the eagle had slowed up in a similar way to get a good look at me on my bike. 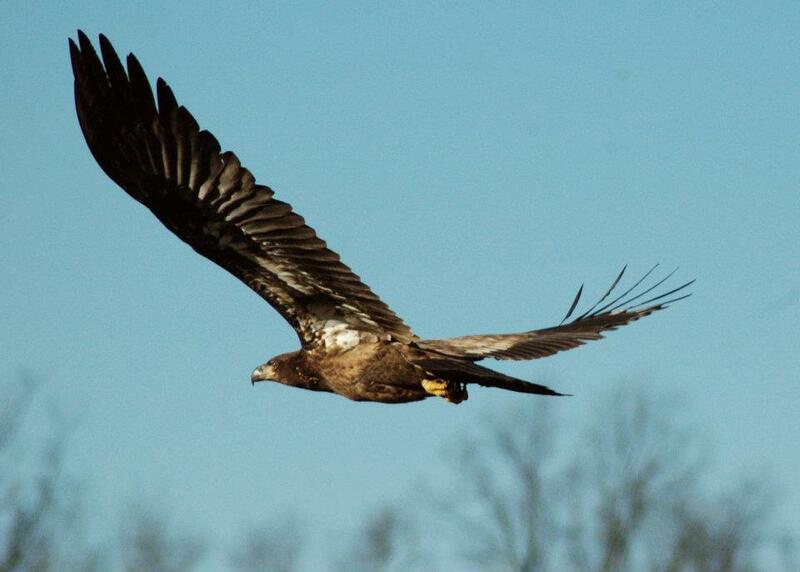 We flew vis-à-vis down the road for long seconds- maybe a quarter mile- until the eagle broke sharply upward, crossed overhead and issued a loud call as if to say, “Nice riding with you! See ya later!” The encounter left my heart pumping with the feeling of pure exhilaration. It’s moments like that one that keep me on my bike all year long, and compel me to find the backroad-less-traveled. Ha! I got so lost in thinking about the moment with the eagle that I got off the topic I sat down to write about in the first place: birdwatching from your bicycle! Cruising down the country roads on a bicycle is a wonderful way to view wildlife – birds especially. It seems that the speed of the bike and its relative confinement to pavement keep birds from worrying like they might if you were on foot. Out on group rides, I’ve become our resident ornithologist, pointing out birds on wires and offering up a fact or two if I know something interesting. I love to be asked, “What’s that one?” and love even more if I don’t know the answer and have to go home and look the bird up. 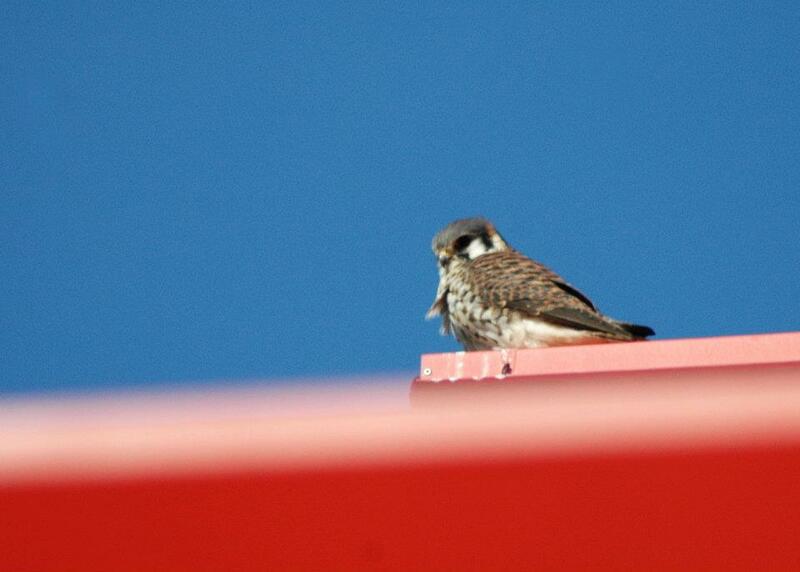 To that end, I’ve decided that this year I am going to fill out a proper birding checklist for cyclists. The tri-state area gives road-warriors the unique opportunity to view several major bird habitats including open grassland or prairie, woods adjacent to agricultural fields , wetlands and marshes, and of course, the tremendously important Mississippi River flyway. Did you know that nearly half of all migratory waterfowl in North America as well as many shorebirds use the Mississippi River to navigate? 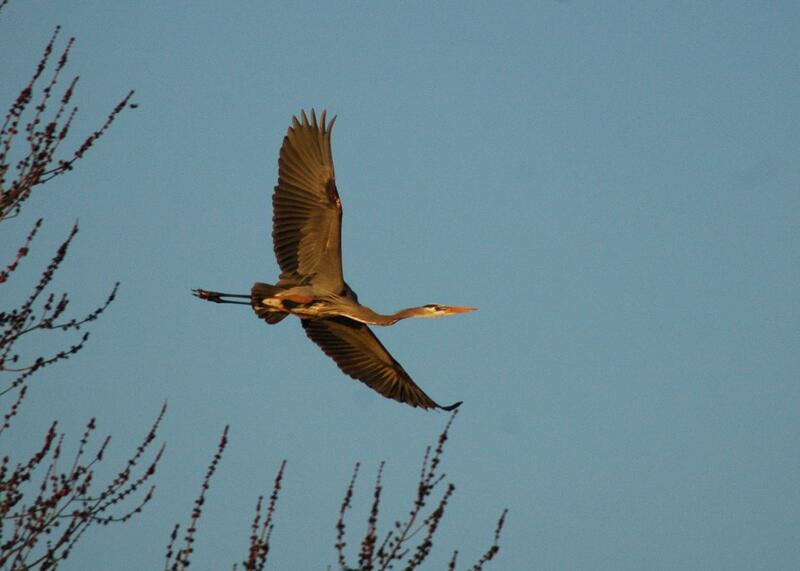 That makes early spring and late fall a particularly great time to cycle along the river bottoms to view species that do not normally make their homes in Illinois. In 2012 the birds that I’ve checked off my bicycle-only viewing list are: Bald Eagle, Red Tailed Hawk, Common Grackle, American Robin, Blue Jay, Turkey Vulture, Great Blue Heron, Bufflehead Duck, Common Golden Eye Duck, Canvas Back Duck, Mallard Duck, Canada Goose, European Swallow, Tufted Titmouse, Killdeer, American Kestrel, Mourning Dove, Rock Pigeon, Downy Woodpecker, Red Headed Woodpecker, Red-Winged Black Bird, Herring Gull, Ring Billed Gull and Cardinal. In my fairly extensive internet searching, I didn’t find a suitable checklist to fold up and put in my bike pouch, so I made one! This list is from the website http://www.illinoisbirds.org/birds_of_illinois1.html and I have reformatted it here to print on one page front and back. 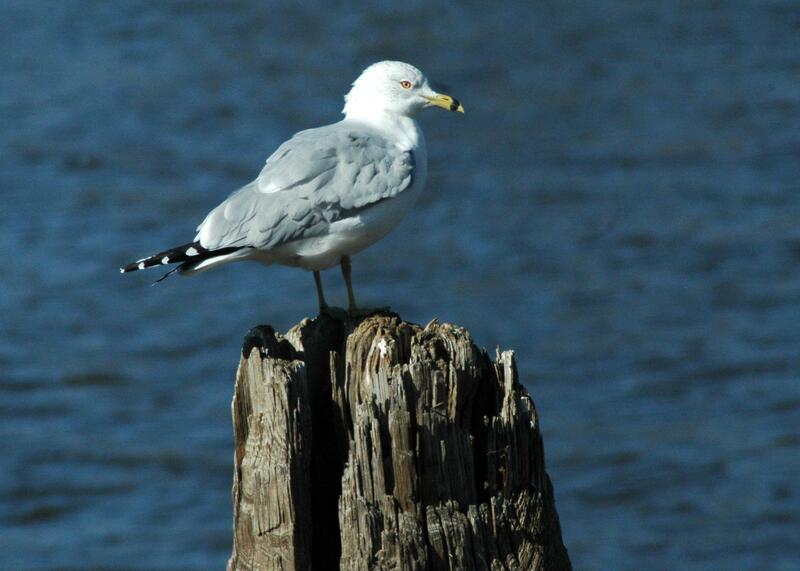 It’s got over 400 species, so it will cover most of the birds you’d see in Illinois, Iowa and Missouri. You may download and print your own checklist by clicking below! 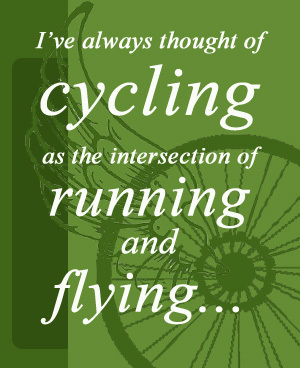 Enjoy bird watching from your bicycle and let me know if you spot anything unusual! 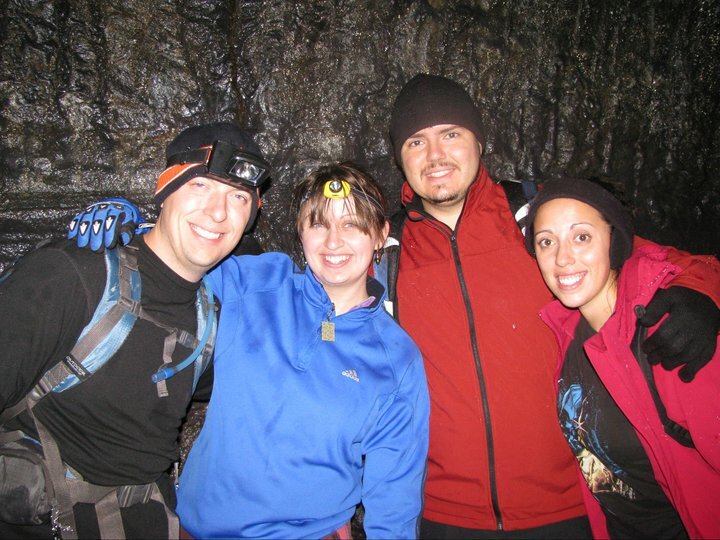 This photo is from the Ape Cave in Washington State in 2010. Many caves east of the Rockies have been closed since 2006. Publicly owned caves throughout the country from the East Coast to Colorado have been closed since 2006 when White Nosed Bat disease was discovered ravaging populations of bats in New York and beyond. I wrote the article below in the spring of last year talking about the disease and the cave closures. While it’s very true that this is a terrible disease with over a 90% mortality rate for affected populations, it is becoming clear that the bats primarily spread the disease among themselves. There’s no evidence that responsible caving with clean gear will spread the fungus among the bats. I’ve contacted the Illinois and Iowa DNR asking about the criteria for the reopening of caves, but no one seems to be able to say when or if the decision will be made to reopen the sites. It would be wonderful to see states reopen supervised caves like Illinois Caverns where no evidence of WNBS has been found. In supervised caves, users can be monitored for cleaning their equipment, and responsible stewardship of these delicate ecosystems can resume. The loss of bats is certainly a catastrophe, but since no causality has been proved, it’s a shame that the state continues to ban responsible outdoors-people from these educational opportunities. I believe it’s time to reopen caves slowly (supervised caves first), to monitor the situation, and to adjust bans to fit the scientific evidence available. Further closure of the caves only discourages people from learning about this special environment and developing an appreciation for all of the wildlife that caves support. I think the main question we’ve got is what are the criteria for reopening caves and is opening the caves a priority in 2012? I don’t think any outdoor enthusiasts disputes the need for protecting the bats, but it seems like the indefinite closure of the caves is counter-productive for protecting them. Studies out east have shown that the primary vector of the disease is the bats themselves and that responsible caving (with clean equipment) can go on without spreading the fungus. I think all outdoors people are concerned with the safety of the bats, but the blanket closures with no criteria for reopening the sites can only decrease awareness of caves and the special ecosystems they provide. Couldn’t supervised sites like IL Caverns require clean equipment and be reopened in 2012? And received the follwing response. It explains part of the IDNR’s plan for research, but does not address the question of when they may consider reopening caves. I also contacted the Iowa DNR and got some positive news from Maquoketa Cave State Park! Laura, We had a meeting yesterday. Nothing is finalizes yet from the meeting but things are looking hopefully for this summer. I wish I could tell you more but we just need to finalize all of our discussions and no which approach we will be taking. But I will say there will be something different this summer than just having all the caves closed. These much maligned winged mammals have long been typecast in horror flicks and nighttime terrors, but the truth is, bats are an integral part of the world’s ecosystem, and indeed, are important in our own backyards. According to the Department of Natural Resources websites, there are around 12 species of bat in Illinois and Missouri; including three species on the endangered species list. Each individual bat in the state can eat up to 3,000 bugs in a single night. Thanks to just the gray bats in Missouri and Illinois, there are 1,080 TONS of flying insects that are not bugging you all summer long. All of the bats in the area are insectivorous, and this massive bug buffet is our best defense against dangerous mosquito populations and diseases they carry, like West Nile Virus. Bats are also important pollinators, and with decline in honeybee populations, they become more important in that respect each year. But something is killing our bats. White Nosed Bat Syndrome was first documented in 2006 in Albany, New York. There, cavers began to notice bats acting strangely, some dead or dying, and many with a strange white fungus around their muzzles. Since the fungus has been discovered, there has been an unprecedented spread of the disease. The cold-loving fungus appears to grow on the bats in the winter and disrupts normal hibernation. The bats awaken too early or too often and exhaust their fat stores and essentially starve to death. In some hibernating populations, the mortality rate is more than 90 percent. The bulk of the cases of WNBS have been in New York and Tennessee, however, the epidemic appears to be spreading and has been seen in nearly all of the Eastern Seaboard and into the Midwest, including Indiana and Ohio. It is believed that the primary spread of the disease is among the bats themselves, however, people who go caving (also called spelunking) may unknowingly spread the fungus between populations on their boots or equipment. Though the fungus itself does not pose a threat to humans, bats are so crucial to our ecosystem that the Department of Natural Resources, U.S. Fish and Wildlife Service and state authorities closed most caves on public land in all of the affected states in 2009, and the closures are still in effect this year. The closures do not affect privately owned caves, however, the DNR urges landowners to be aware of the problem and report any dead bats found on their properties.